The classic part has to do with the vest. The vest has been with us for as long as the years will reveal and there are so many ways you can wear one. If you're cold, wear it under something like a nice linen jacket. If you're not, wear it over a t-shirt like the way I'm wearing mine. Or, go ahead and wear a camisole underneath. I designed it so your undergarment straps will be hidden. The stitch pattern hints of "crochet," but it isn't. It is a simple, four-row/round repeat. Plus, the vest is knit from the top down, and in the round, so there are no seams. There aren't even any seams on the tops of the shoulders! Fad-Classic is perfect for an intermediate knitter. If you're an adventurous beginner who knows how to knit in the round and follow and incorporate a stitch pattern, go for it. Click on the button below to buy a copy. It will be sent to you in a zipped PDF file via email. Thanks! Wendy you are so stink-en CUTE! 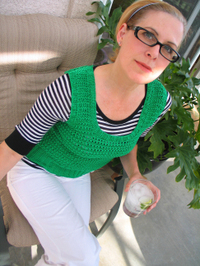 I love that bracelet and you ROCK that striped shirt under that green beauty of a vest! Way to go on another fun pattern girl! Wendy, you've done it again. What a great pattern. I am totally feeling that shade of green! I love that bracelet, too! Are those palm seeds? I have a bracelet I got in the Virgin Islands made of palm seeds. Did you make that? Very cute - and that was a FAB purse!! congrats on another great pattern becoming available... you're so prolific with these! The gin and tonic is the perfect accessory. So fresh and green! *L O V E* it! I was just drooling over some little pointy-toed flats in this very color - diggin the green for sure! Love the versatility, a must-have for the wardrobe! Nicely done my dear! Just downloaded the pattern - so well written - Thanks! I can't wait to make this cute vest! Very cute! I'm curious, does this pattern have waist-shaping (if that's what you call it), or is the body straight up and down? Terri, the pattern does have waist shaping. It is meant for a tight fit so you don't need much, but there definitely is some shaping going on. i think i can do this! and what are you drinking? looks refreshing! Thanks for the cute pattern--can't wait to knit it up! I expecially appreciate your "big girl" sizes! how tall is the pattern for the smallest size? I am looking for a cute sleevless top to knit that isn't super short. I think 21 inches or so is what I am looking for..
Pixie, the smallest one is about 20 inches, but you can easily add an inch. I tell you where to do the in the pattern. I'm stoked, I got the pattern last night from TGB. I noticed that Green Gable from zephyrstyle is no longer on the needles - does that mean you finished it or decided not to knit it? I was really looking forward to seeing your FO. Pics to come on the Green Gables... Yes, I'm fini! Fabulous. As if your blog wasn't already enough to brighten my days...you go a step farther with such fun and realistic (as in i will actually wear this) patterns. Bravo...and please keep them coming! Absolutely love the vest Wendy! And even your drink matches your outfit -- you are so stylin'! Going to buy the pattern right now! Thanks for another beautiful knit! Hey again Wendy -- I may have missed it but have you mentioned alternate yarn options for this vest? You are a GENIUS. No, I mean it. I love this vest! I just went to your site and bought the pattern! No seams, you are such a blessing and talented too!